Quite possibly the most anticipated Leica camera since the M9, the Leica T (Typ 701) is finally here, well almost (in stores around 4 weeks from now). Launching with two lenses – a SUMMICRON-T 1:2/23 ASPH and a VARIO-ELMAR-T 1:3.5-5.6/18-56 ASPH, the camera starts off with a very sound lens combination that works very well together, with more lenses to come later this year. With the sensor being an APS-C Size with a magnification ratio of 1.5, those lenses become 35mm f/2 and a 27-84mm f/3.5-5.6 in full-frame 35mm terms. The camera will be launched in silver with a black option to come from July. I am often asked about the stories behind my pictures, and today I will begin the first of many posts about the unique stories behind some of my work. I am starting with a picture of American Comedian Dave Chappelle for good reason. Out of every celebrity I've ever worked with, I think Dave Chappelle was the most appreciative and complimentary - which is great for the photographers' ego. He gave me plenty of feedback and appreciated the way I worked, my vision and put all his trust in me - something often unheard of in this industry. ....so now to the picture. I had about 30 seconds to shoot it after a show before heading to the after party and the set was shutting down, so time was critical. I always tell my students to spend at least 50-70% or more of their time planning, and the rest shooting. Precise planning is key, especially when you have such limited time. I asked production to turn on the house lights and backlight on Chappelle. Now all I needed was the key light (main light). I decided to use the Ice Light as my key light because like the environment, the light would be constant and shooting would be fast, and I'd be able to see the effect of the light and shadow as I pressed the shutter. All I needed to do was put the Ice Light at a power level and distance that matched the ambient light in intensity. All too often I see external light sources like flashes used in these situations where the added light looks very obvious and un-natural. The key to keeping artificial/added light natural is getting the balance right with the environment. Technically, this is quite a simple picture, but getting it right in-camera is a trademark of mine so I controlled everything with manual exposure mode. 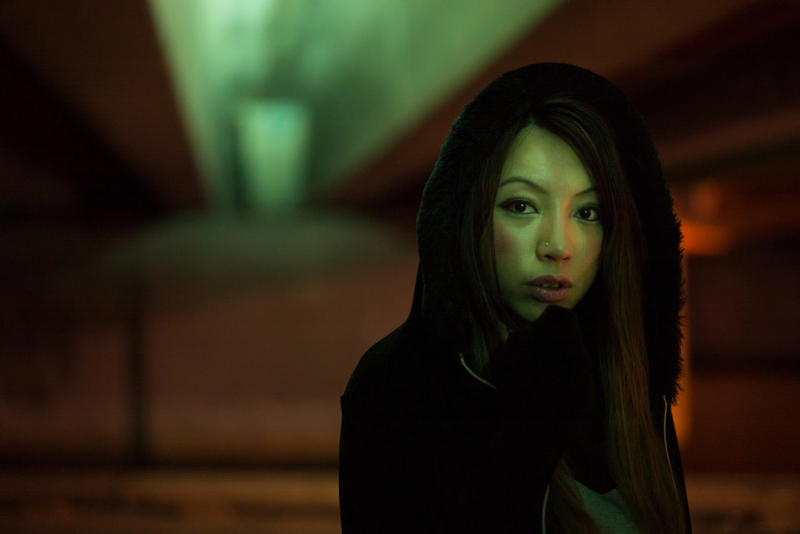 The first thing I did was select a colour balance around Tungsten (3200K). I don't use a light meter anymore, so I selected an ISO of 1600, and aperture of f/4 which was one stop down from maximum aperture, giving me a little more depth of field and a tad more sharpness on a 14-24mm lens, set to 14mm. The resulting shutter speed in manual exposure mode was 1/100sec, which is a little slower than I normally like to use, but at 14mm i was confident in getting a sharp exposure if I balanced my elbow on my knee. As the lens was so wide it was important I didn't tilt upward too much, and I kept his head towards the centre of the frame where the distortion would be kept to a minimum. Lastly, Dave isn't the type of celebrity that loves to pose. He loves to do his own thing and has the trust in me that I'll handle the rest. All I did was direct his body position a little and the result was final. Hope you like it! 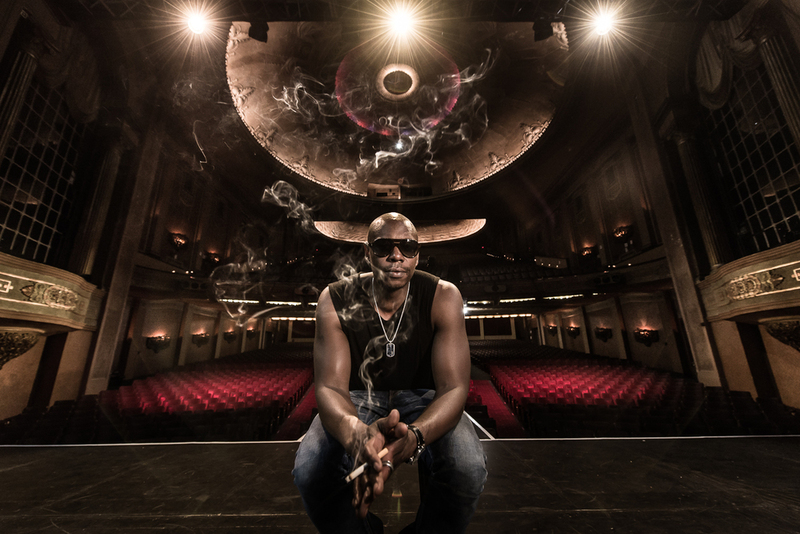 EDIT: Here is the picture recently used in Times Square, New York to promote Chappelle's upcoming shows. Today I'd like to share a short story I shot in between my assignments during the Cannes Film Festival in 2008. 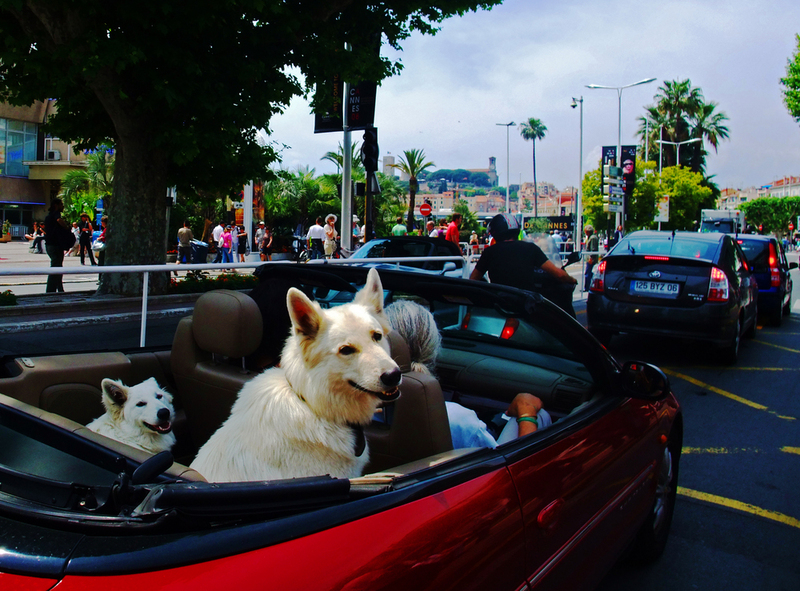 In between assignments I would walk the streets of Cannes and noticed that there was a very strong dog culture that could not be ignored. I decided to document very quickly and candidly some of the dogs I'd encounter or pass by on the way to each assignment. As I had very little time to get from one job to another, I chose my compact camera in auto to shoot these pictures on the fly. You know the saying “Be careful what you wish for, because you might just get it”…..well Zeiss listened and delivered…in size! 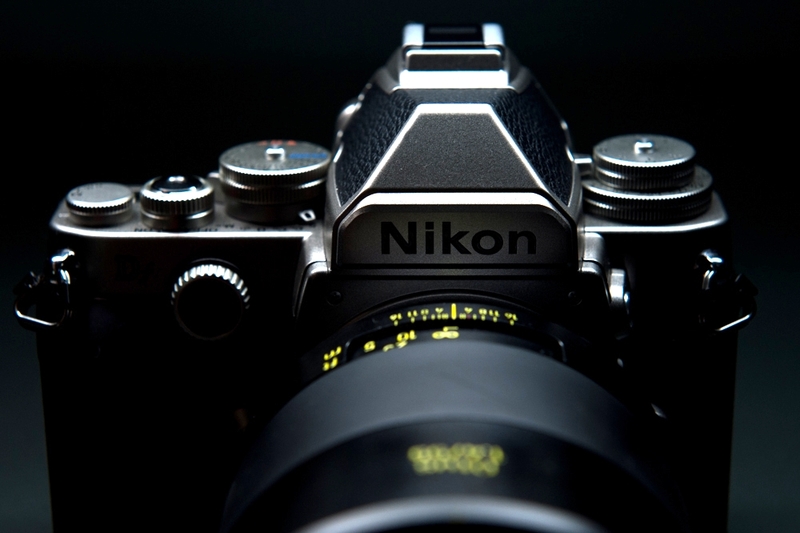 It’s not often I feel compelled to take the time to share my impressions of camera gear. In fact, as of lately I’ve been less than excited about cameras and lenses because there’s something new out every week, followed by countless positive reviews about how amazing they are, followed by many enthusiasts buying them in hope of better pictures. This never-ending cycle is something I used to be very caught up in, and luckily, I’m over it now – or maybe not. Just a short video I made while back with the Leica M240 at Australian Fashion Week. Keep in mind backstage light is mixed with various light sources all emitting different color temperatures. All pictures were color corrected as well as possible, but when light is mixed, it is impossible to achieve perfect colors. This is what happens when one light source is not overpowering the exposure than other. They end up blending together, It's just physics, and often what photographers encounter in such situations. .....I took the new Leica M (type240) for a test drive, using the Leica Summarit 50/2.5 and Voigtländer Nokton 35/1.2 II lenses. All pictures were shot using natural light, and sometimes lit using the Ice Light and Nikon SB-910 speedlight on the SC-29 cable. Files were captured in DNG and edited in Lightroom 4.4. No photo manipulation was used. I intended to spend a lot of time capturing the best quality pictures I could over the week, but I had obligations to shoot runway for many of the designers, so my time backstage was very limited to a period of 2 hours. The Leica M was fantastic to use. The battery life was great, new frame lines made framing and composition much easier and the the quieter shutter (as used in this video) made the camera even more discreet. Today at The Digital Show 2013 I was fortunate to meet with Leica Camera CEO, Alfred Schopf and Leica Camera Managing Director of Asia Pacific, Sunil Kaul. They were kind enough to not only exhibit 6 of my pictures taken with the Leica M (typ 240) but spare some time for a few questions.